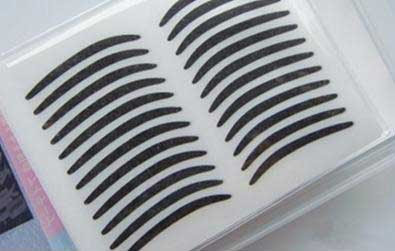 HAVE YOU TRIED USING EYELINER PATCH? 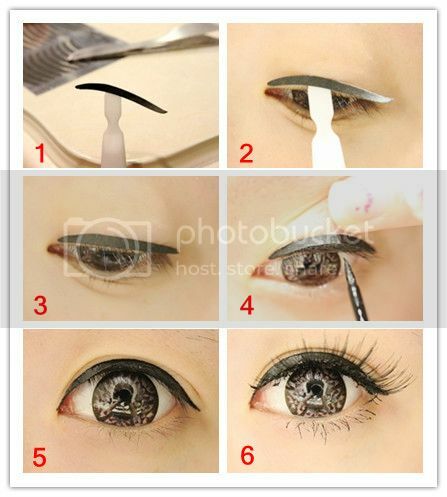 So you're tired putting on those eyeliners to make your eyes look fuller and livelier, I do. I must admit other than lipstick, eyeliner is one of the beauty implements I can't live without, I look so damn naked without those, probably it's just me, but whatever, here's a dang perfect solution to that problem, the Malaysians called this 'eyeliner patch', yeah because I saw it in a Malaysian deal store and they're selling this at 50% off at a beautiful price of RM30 (Malaysian Ringgit) or about $0.322061, forgive the figure I did just copy that from a currency conversion site. That's cheap and convenient. I haven't tried this though, but would love too, in fact, it's my first me seeing this, keke. It looks like ribs, lol. So this is how you're going to put it ... I guess this needs precise skill, well, women are good at this, can even drive a car putting on a mascara, maybe with constant patching, but it doesn't say how to remove it, I guess it'll go with water and soap. I won't use this either when used with glue or anything that sticks the skin, that would be another painful beauty regimen.... ahhh well, to be beautiful is always painful ... but not my eyes, can't blog anymore with that...lol.